43 EBEN X "You know your test plan worked." 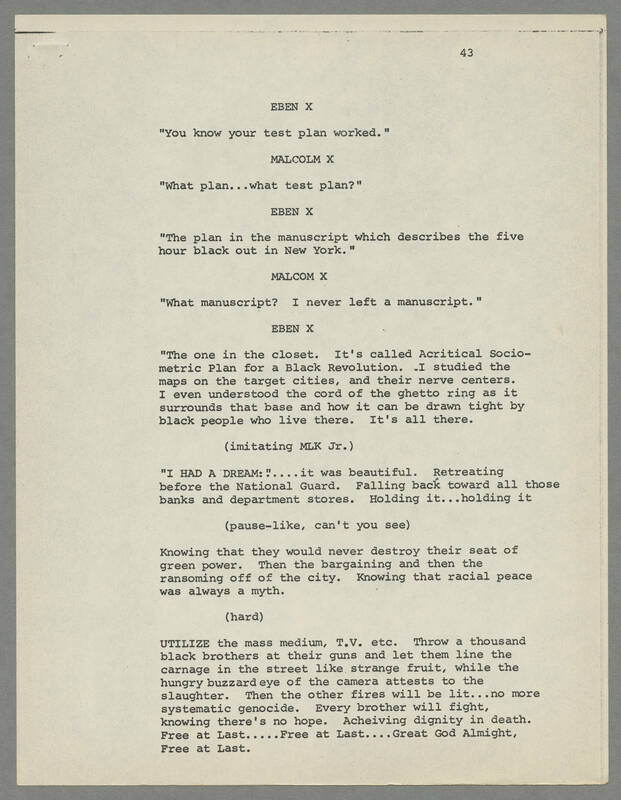 MALCOLM X "What plan...what test plan?" EBEN X "The plan in the manuscript which describes the five hour black out in New York." MALCOM X "What manuscript? I never left a manuscript." EBEN X "The one in the closet. It's called Acritical Socio-metric Plan fr a Black Revolution. I studied the maps on the target cities, and their nerve centers. I even understood the cord of the ghetto ring as it surrounds that base and how it can be drawn tight by black people who live there. It's all there. (imitating MLK Jr.) "I HAD A DREAM:. "....it was beautiful. Retreating before the National Guard. Falling back toward all those banks and department stores. Holding it...holding it (pause-like, can't you see) Knowing that they would never destroy their seat of green power. Then the bargaining and then the ransoming off of the city. Knowing that racial peace is always a myth. (hard) UTILIZE the mass medium, T.V. etc. Throw a thousand black brothers at their guns and let them line the carnage in the street like strange fruit, while the hungry buzzard eye of the camera attests to the slaughter. Then the other fires will be lit...no more systematic genocide. Every brother will fight, knowing there's no hope. Acheiving dignity in death. Free at Last.....Free at Last....Great God Almight, Free at Last.